Over 107 children have found refuge at Sabuli’s Children Center thoughout the last decade. With continued support we are able to care for these precious lives. These were the first infants to join the Children’s centre back in May 2014. You can listen to their story. Since then, over 20 infants have be loved and cared for and given new life. Below, look how they’ve grown already turning 5. When she was only 10, one night while fishing on the Congo River in a canoe, her father was struck by lightening. She was tossed overboard. When she climbed back in the canoe she found her father dead. She pulled the canoe with her father in it with one hand and used her other hand to push through the river's current to shore all through the night. A local village pastor knew she would be best cared for by Sabuli, the director of the only orphanage, 435 miles away. 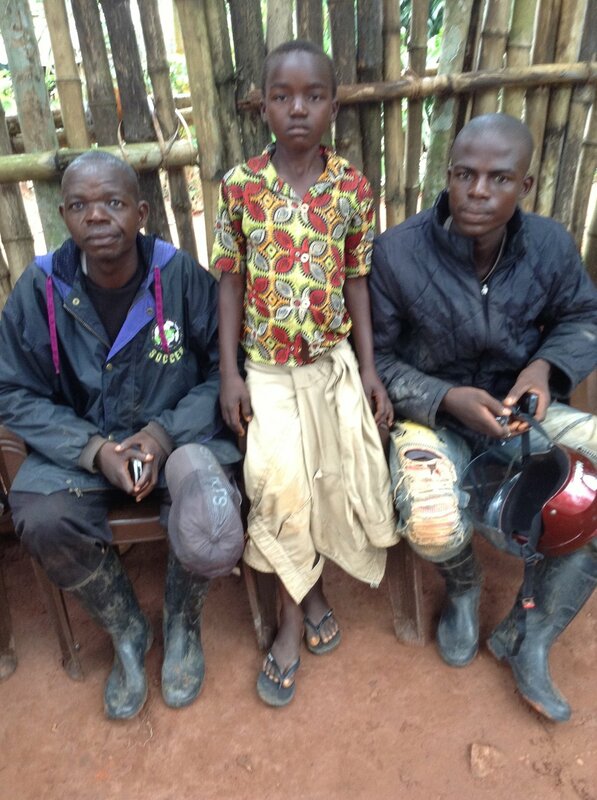 They traveled by motorbike 700 kilometers to the Sabuli Children's Center. Kristine works hard in school and loves to sing with her many sisters. She has found hope again. Pictured above; 10 year old Kristine with a local pastor. Here is Beni in 2018, now a big sister at the Center. Fiston’s mother was only 13 years old. She didnt even realize she was pregnant and thought she had worms. She gave birth alone in the village without any medical care and bled to death. Fiston was fed water and sugar to keep him alive for a whole week before his Father brought him to the Center in desperate need for help. Fiston is now a healthy growing baby, his life saved by formula milk. But there are other stories too, like sweet little Merve whom we lose due to lack of medical care. She was so tiny at 16 months old, malnourished and unable to stand. She had been barley kept alive by her 8 yr old older sister on tea and pondue. Her mother had died a a few months prior and her father had 5 young children at the time. He begged Mama Sabuli to care for her though she was already very sick. Her father had gone to Traditional medicine to heal her with no avail. She was only with us a month before she passed away. Please consider supporting the work we do here in the Congo to reach the vulnerable before its to late. Our mothers died in childbirth.